FXpansion, a London-based developer of computer based plug-in effects and synthesizers, today announced the debut of D-CAM: Synth Squad at the Winter NAMM show in Anaheim, California. FXpansion employs its proprietary advanced modeling technology to carefully reconstruct the unmatched sound of vintage hardware on the computer desktop. DCAM: Synth Squad will be available worldwide in Q2 2009, price TBA. D-CAM: Synth Squad is comprised of three modeled synthesizers, Strobe, Cypher and Amber that combine the best features found in classic synths with new modern features. The synths are brought together with Fusor, a semi- modular synth-layering environment. D-CAM: Synth Squad is compatible with all major plug-in formats and sequencing environments, and comes complete with a large suite of presets ready to engage and tweak. - Strobe : a stripped-down performance synth, as easy to program as classic monosynths, with the added benefit of polyphony, osc stacking and detuning, and a versatile multimode filter. Strobe specializes in ripping analog leads, sick basses and complex pads. 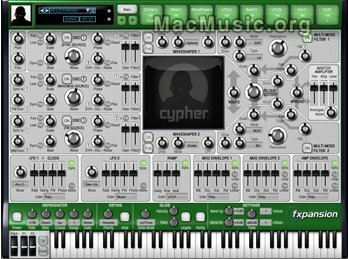 - Cypher : geared towards audio-rate modulation of various types, features variable-depth sync, polyphonic waveshaping and syncable beat-detune. Cypher takes pure analog FM to the next level, introducing possibilities that are only possible with digital technology, without sacrificing the edgy rawness that analog audio-rate modulation provides. Amber: a lush string-synth centering on divide-down oscillator architecture with the bonus of formant filtering and 3 chorus models. Amber's sound is creamy, thick and psychedelic sound. - Fusor : a semi-modular synth layering environment with extra LFOs, envelope followers, step-sequencers and a suite of circuit-modelled FX that can be used on each of 3 synth instances as inserts and aux sends, as well as on the master output. The FuseMod inter-modulation system allows the user to use the LFOs and envelopes from one synth to control and affect other synth and effect parameters. - MIDI Learn, BPM synced LFOs and envelopes, multiple oversampling for offline rendering, intuitive visualization and all the other conveniences you have come to expect from software synthesis.